It’s a holiday week with a big Thursday slate, so today we’re looking at the Thanksgiving DFS offerings on DraftKings for fantasy football players who want in on the holiday action. Playing on these types of short slates brings back a preseason-esque feel. DFS players who are willing to put in the time for research and roster highly correlated plays will likely prosper more than the guy casually entering from his phone sitting on grandma’s couch. If you happen to be said couch guy, hopefully this article can help summarize the slate well enough to lead you to finish in the green in some DK tournaments on Thursday. Let’s get right to it. Zeke may be this week’s highest-owned player, regardless of position. He’s coming off back-to-back 100-yard outings where he scored 39.7 DK points and 36.1. He’s averaging 23.3 touches per game this year should be the focal point of the offense this week against a banged-up visiting Washington team. It is noteworthy that Washington held Elliott to just 33 rushing yards in their previous matchup (6.2 DK points), but were just shellacked for 100-plus yards from scrimmage to Lamar Miller and Jacquizz Rodgers. When those two players can put up numbers on your defense, the matchup becomes less of a worry. Pace is our biggest concern with two lethargic offenses likely trying to run out the clock on each other and limit mistakes. Zeke subsequently may not have the highest ceiling of all players, but he arguably has the highest floor with Dallas playing as 7.5-point home favorites. In the previous matchup against the Falcons, Kamara went off for an absurd receiving stat line of 15-124-0 on 20 targets. Add in his rushing production and the Saints’ stud running back totaled a 37.0-point fantasy outing. Mark Ingram is now in the mix to temper our offensive expectations, but Kamara remains a strong fantasy play this week in a game where the Saints are currently implied for 36.25 points. The Saints offense was on fire last week, continuing to rack up points aggressively even late into the game. We’ve seen back-to-back blowouts by New Orleans now and in these matchups, Kamara has averaged 15 touches (22 DK points) while Ingram has averaged 16 (26.8 DK points). If you think this game has a chance of blowing out — New Orleans is currently a 13-point home favorite — Kamara should not be the only Saints running back you roster Thursday. I mentioned Zeke’s appeal already above and I’ll be trying to pair him with his defense wherever I can. The Cowboys defense is going up against an offensive line that has been decimated with injuries. Dallas sports a top-five pressure rate (12.8%) that could lead to a long day for backup Colt McCoy, who has a sack percentage of 11.7% during his past four years with Washington. Not helping McCoy’s case is that the Cowboys are playing at home as 7.5-point favorites. If this defense can take advantage of this banged up offensive line and pressure McCoy into sacks or turnovers, it could set up well for Zeke and the rest of this Cowboys offense. If the Saints are going to follow this projected blowout gamescript, the Falcons will be passing heavily. Ryan had a fantastic game at home in Week 3 against the Saints, throwing for 374 yards and five touchdowns. This current Saints defense is far from the one they faced in Week 3, but there’s reason for optimism with Atlanta’s offensive line allowing pressure on just 5.0%% of dropbacks. Outside of Carson Wentz last week, opposing quarterbacks have had some ceiling performances in shootouts with New Orleans. Ryan and Ryan Fitzpatrick both netted 40-plus DK points on them early in the season. Jared Goff (33.3), Kirk Cousins (24.7), and Joe Flacco (19.6) have all done well in recent weeks. Pairing Ryan with Jones will be a lesspopular move than you may think with Jones’ salary ($8,300) limiting you in running back-heavy lineups. 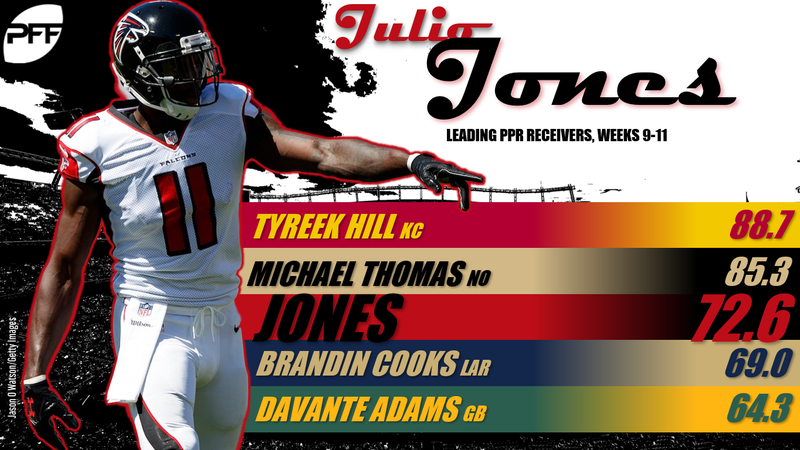 Calvin Ridley had the big fantasy outing against NO earlier this year (three touchdowns), but Jones has been on fire over the past three weeks averaging 27.2 DK points while seeing 52% of the Falcons’ air yards and 24% of the team’s targets and reaching the end zone in each game. In lineups where I’m not rostering Zeke and the Saints running backs, Cohen is the fourth and final running back in my very shallow player pool. MLB Jarrad Davis is outside our top-50 in graded pass-coverage linebackers and has allowed 26-of-35 targets against him to be caught for a 114.2 passer rating when targeted against. Cohen could take any target against Davis and break it for a long one. With Mitchell Trubisky possibly sidelined in this one, we could see a creative game plan from Matt Nagy who has done a fantastic job of utilizing Cohen in space this year (2.40 YPRR). We saw in the preseason that Chase Daniel had an affinity for running back checkdowns and gets one of the league’s most electric playmakers in space at his disposal this week. I mentioned Maurice Harris as someone to drop in season-long teams, and it’s largely due to the emergence of Quinn as the team’s slot receiver. Quinn was a preseason favorite that won over many after falling in the draft. Quinn led all Washington receivers in slot routes run last week and was second on the team in total routes run. He should provide a nice safety blanket for McCoy when he feels pressure. Quinn also provides massive leverage over what should be a chalky Bruce Ellington, who surprised many last week with a nine-target outing (6-52-0). Banking on cheap wide receivers repeating isn’t always a lock and I’d rather find the few extra hundred dollars for Quinn, who should be trailing and could be penciled in for six-plus targets. 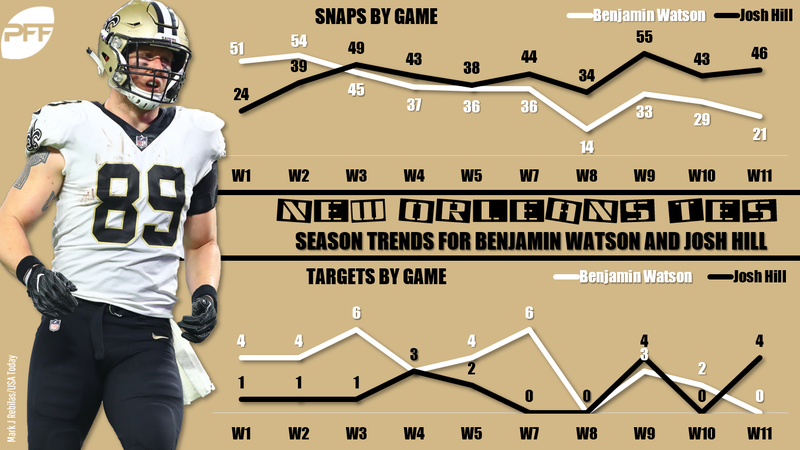 Benjamin Watson’s role has been declining. Over the past three weeks, his snaps have gone down from 33 to 31 to 24. His targets have declined three to two to zero. Punting at the tight end position has been a viable option for much of this year and this slate is no different. While Watson has seen his numbers decline, Hill’s snaps have doubled that of Watson and he’s coming off a 2-26-0 game with an end zone target. Priced at $2,500, Hill’s likely not going to net you a zero, and he provides high touchdown equity in a game that’s currently projected for 59.5 points.